Mississauga known mainly for Lester B. Pearson International Airport, Canada's busiest airport deserves to be explored as one of Canada’s most multicultural cities. Mississauga offers an impressive cultural heritage and a whole spectrum of different sights. Located on the shores of Lake Ontario, Mississauga boasts a lakeside promenade with a range of natural sceneries. Any shopaholic will enjoy a stay in one of our Novotel hotels conveniently located close to the massive Square One Shopping Centre, with its 360 stores and 20 minutes to downtown Toronto and Toronto Airport. Why not then go for a stroll in the tranquil isolation of Lakefront Promenade Park before exploring a local art opening at the Living Arts Centre, enjoying a play at the Meadowvale Theatre or savouring the sweet sounds of jazz, classical and pop music at the Mississauga Symphony? The history buffs and families will love the visit of Streetsville, Mississauga’s ‘Village in the City.’ Sitting on the banks of the scenic Credit River, Streetsville offers historic storefronts, where you can enjoy a variety of creature comforts from spa treatments to lattes at one of the neighbourhood’s inviting cafes while your kids are climbing the steps around the lighthouse or watching the fishing boats. Mississauga is a city of contrast. But it is exactly Mississauga’s contrasting character that gives its appeal.Enjoy the sights and activities of Mississauga and stay at a Novotel hotel! 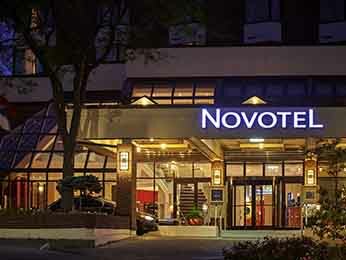 The Novotel Toronto Mississauga hotel offers great value and is accessible to the town and the surrounding area. It is your guarantee of a great stay in Canada.